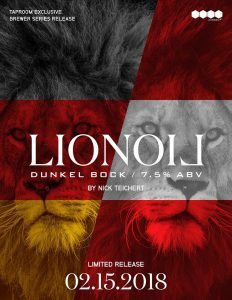 Brewer Series – LionOil Dunkel Bock Release! Every month our brewers get to play around with our pilot system, brewing one quarter barrel at a time. It’s the perfect opportunity for our amazing team to express themselves with a unique concoction that will be served only in our taproom. These exclusive one of a kind beers will be tapped the 3rd Thursday of every month and shouldn’t be missed. This month we have a Dunkel Bock brewed by Nick!